Here is a healthy take on the classic eggplant stir-fry from Chinese restaurants. 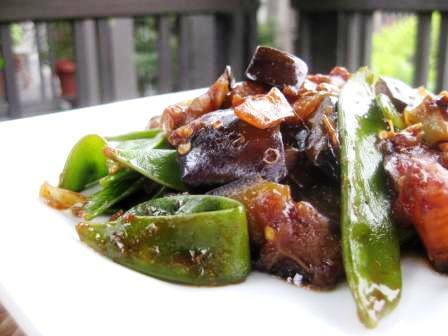 This version is loaded with eggplant and the snow peas adds a nice color to the dish. This simple eggplant recipe is aromatic and flavorful and makes a terrific side dish or meal served over brown or jasmine rice. You can also add tofu to this dish to bulk up the protein for a filling vegetarian meal. It also works with any type of eggplant – whatever is fresh and available where you live. Prepare sauce by mixing together all sauce ingredients except cornstarch. Prepare the cornstarch and water mixture in a separate cup or bowl. Set both aside. Chop the eggplant up into bite-size pieces. Season with salt and let stand for 30 minutes, rinse salt off and thoroughly dry. Place 2-3 Tbsp. oil to a wok or large frying pan over medium-high heat. Add the garlic, snow peas, and eggplant. Add 2 Tbsp. soy sauce and continue stir-frying for 5 more minutes, or until the eggplant is soft and the white flesh is almost translucent. When the eggplant is soft, add the sauce. thanks for the tips. It will be a lot of discipline for me not to order something slathered in sauce. Those are usually my favorite dishes! Tried this recipe last night and it was delicious! Didn’t have snow peas, so I substituted broccoli instead.